SALT LAKE CITY – Andy Phillips kicked three field goals and the Utah defense held UCLA to its lowest offensive output of the season — but the No. 18 Utes fell to UCLA, 17-9 on Saturday afternoon. Utah’s last hope at a comeback ended with a fumble on a handoff exchange between Travis Wilson and Joe Wilson with one minute remaining, enabling the Bruins to run out the clock. UCLA took a quick 10-0 lead after scores on its first two drives. The Bruins opened the game with a touchdown after a six-play, 87-yard drive over 1:47 that culminated in a 28-yard touchdown reception. Although Utah drove 61 yards on the ensuing possession, the Utes turned the ball over on a fumble in the red zone and UCLA turned its drive into three points with a 33-yard field goal with 4:01 left in the first quarter. The Utes got on the board in the second quarter as Phillips hit a pair of 39-yard field goals, cutting the UCLA lead to 10-6 going into halftime. Utah had a strong second quarter, surrendering just 15 total yards to the Bruins while holding the ball for 12:10 minutes on offense and putting up 133 yards. Utah came out of the locker room and scored on its first drive of the second half with Phillips hitting a 21-yard field goal after UCLA made a goal-line stand to keep the Utes out of the end zone, putting Utah within a point, 10-9 with 8:39 left in the third quarter. UCLA came back on its first second-half drive to score a touchdown on a two-yard run after a 69-yard drive to give the Bruins an eight-point lead, 17-9 with 5:17 remaining in the third quarter. From there the defenses took over. The Utes punted four times in the second half while the Utah defense forced UCLA into punting three times while the Bruins kicker missed a field goal for just the second time this season. 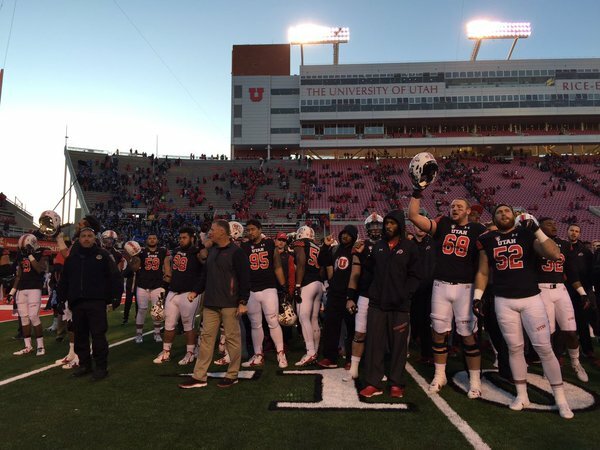 The Utes held UCLA to season lows in both total offense (325 yards) and points scored (17). On Utah’s final drive of the game with 3:09 left and down by eight, the Utes went 48 yards downfield before a fumble at the 38-yard line turned the ball over to the Bruins with a minute remaining. In the absence of Devontae Booker, one of the nation’s top running backs, Joe Williams ran for 121 yards on 26 carries. He also had four catches for 31 yards. Travis Wilsonwas 13-for-26 for 110 yards passing and also had 67 yards rushing. Harrison Handley had three receptions for 32 yards, including a long catch of 20 yards. Jared Norris led Utah with 11 tackles, including two tackles for loss and a pass breakup. Gionni Paul recorded 10 tackles. Kylie Fitts, a transfer from UCLA, had seven tackles (one tackle for loss) and three pass breakups. Injuries have continued to disseminate the Utes, with leading receiver Britain Covey going down during the game. Other starters who have spent time on the sidelines or gone down for the season include Booker, Hunter Dimick, Reginald Porter, Filipo Mokofisi, Chase Hansen, Jared Norris, Siale Fakailoatonga and Evan Moeai. Utah closes out the regular season against Colorado on Saturday, Nov. 28, at 12:30 p.m. MT.